How beautiful and touching that they did this. Meghan is highly pregnant and she could've been excused. But no, she shows up as well, dressing modest in the colour of mourning and kneeling down to lay the flowers. RESPECT! And, by the way, she has a very nice signature! What a beautiful coat. I am so sorry we are seeing it on such a sad occasion. Agree. It's horrible. Why can't people just live in peace with each other! And yesterday a shooting in my country as well... the world is a cruel place, so let us stay nice and kind here, as a message, and to be a simple example of how small deeds of kindness keep the darkness at bay. An appropriate outfit for a somber occasion. Boh Runga is a New Zealand jewelry company. The earrings feature the native Miromiro feather which in Māori mythology was "a magic token of devotion that would bring loved ones back to you." I found that tribute thoughtful and poignant given the context. 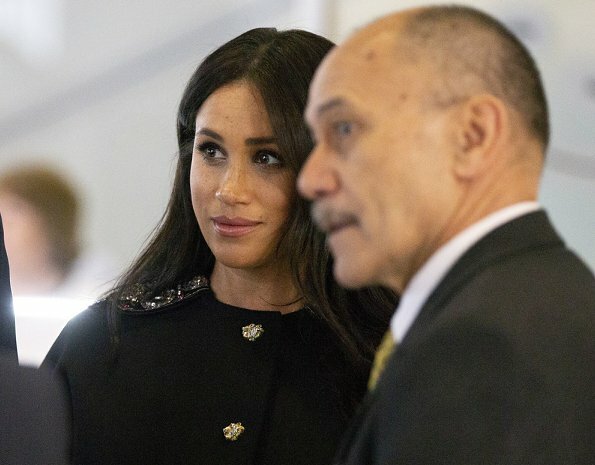 I read somewhere that those earrings were a gift to Meghan from the New Zealand Prime Minister Jacinda Arden on their recent visit. 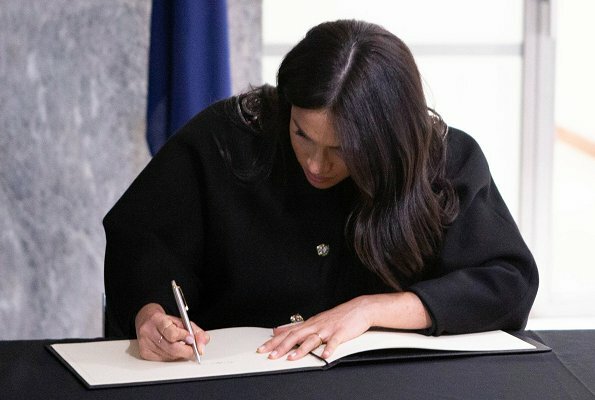 Lovely of Meghan to wear them on this occasion, both in solidarity with the country and support of the excellent work of the Prime Minister in connection with this tragedy. I somehow feel uneasy with this. Such a tragedy should not be another photo op for bump cradling and overexpensive clothes. What you wear has nothing to do how you feel. That comment is food for thought. 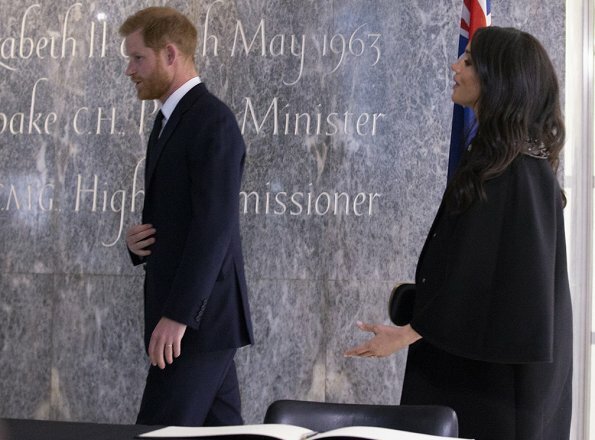 Meghan does over-expose her bump cradling, and I am sure she had black coats. However, it's their money and her baby. Amen. What should Meghan have worn? Sackcloth? She would have been criticized for wearing cheap clothes and not showing respect by wearing her best and showing up in an inferior outfit. And Meghan has cradled her pregnant tummy throughout her pregnancy (and there is absolutely nothing wrong with doing so). Had she not done it today, it would have been strange and criticized. This woman cannot win. It's very disturbing. 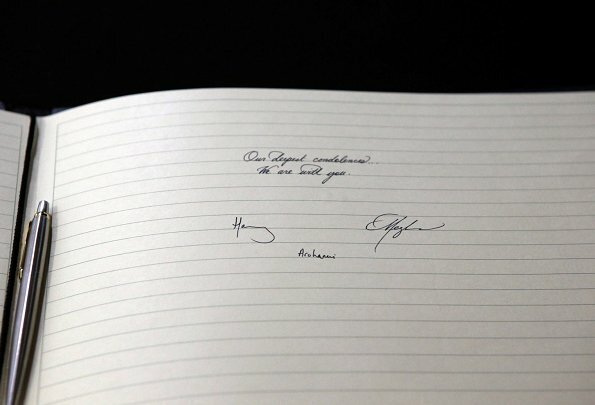 Meghan and Harry were asked by the Queen to represent her and the country and they did so respectfully and beautifully in somber and excellently tailored clothes. Meghan could have sat at home with her feet up in this final stage of pregnancy. But she put on her best and did her duty. Good job. Anons 11:10 and 1:06 ~ Just not the time for a comment like this. Please keep in mind why she is there and keep the negative comments at bay please. If she wasn't well-turned-out, there would be criticism of a different kind. Oh please... you can't honestly be serious can you? Amidst their effort to visit and good deed in the wake of such a tragedy it's her connection with her unborn child and the price of her clothes that you choose to notice and make you uneasy??? Really?? Is there a day when some people can't find something to be offended, like a black coat, a pregnancy, or a good deed?. The woman is pregnant, a rather normal condition, would it be better to hide her in the tower? I commend Meghan for her presence when she could have been easily excused. Good choice of clothing, and lovely shoes. I agree with Pine and Chardonn8r. 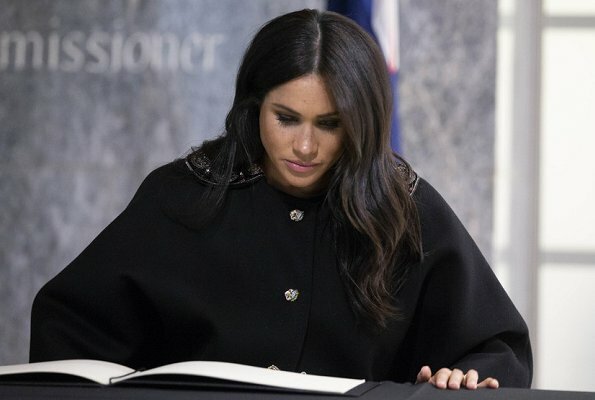 Like I said, Meghan could've been excused, but she choose to be here, to pay respect. Dressed sober and appropriate for the occasion. As long as she has the money to buy expensive clothes, well, let her do that. I bet that, if we all were rich, we would buy more expensive clothing as well. And the bump cradling was not disturbing for me, on other events she did it way more! I simply admire the fact that they were here. That they did this. And that they brought out a beautiful message to the world, of kindness, humanity and love for the people. So, what should she have worn; her bath robe and slippers? Perhaps maternity jeans and a black t-shirt? Sheessssh. I'm trying to keep in mind what "RosalynMarch 20, 2019 at 12:40 AM" wrote but you're making that really hard. WoW. 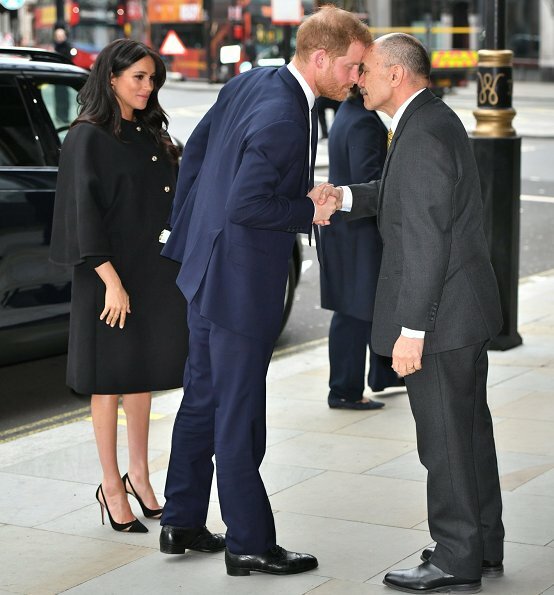 Who had time to be focused on Meghan except the media with their cameras? She and her husband were dressed appropriately for this sad occasion and event and I can't believe she still gets criticized over what she was wearing. It's just too much hatred in this world and too many judgmental people at the highest. Let the lady live her life and do her job and stop acting like you know more about the woman than she does herself! Anonymous @ 1:02. It's not USA, it's UK!. What an unfortunate comment, your colors are showing. Not to mention the terrible comparisons between the 2 women, what a sad way to plant the seeds of unhealthy competition. I am going to move on, and focus on the positive comments on this forum , and offer my condolences to all the victims families and friends, as well as the nation of NZ, may this hate and violence cease. Ist Meghan nicht schon im Mutterschutz? Elegantes Outfit insgesamt. 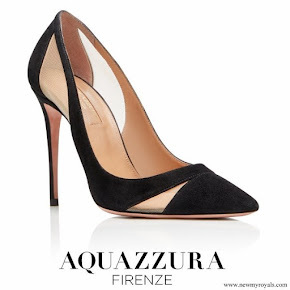 Hätte nur andere Pumps gewählt: dezenter irgendwie für diesen Anlass. Good of them to go. On the register, what's that word at the bottom, between their names? Oh thanks Diane. That's even nicer to know, and I'm even more touched now by their kind sentiments. Nice Gucci coat. Remembered a very sad event. 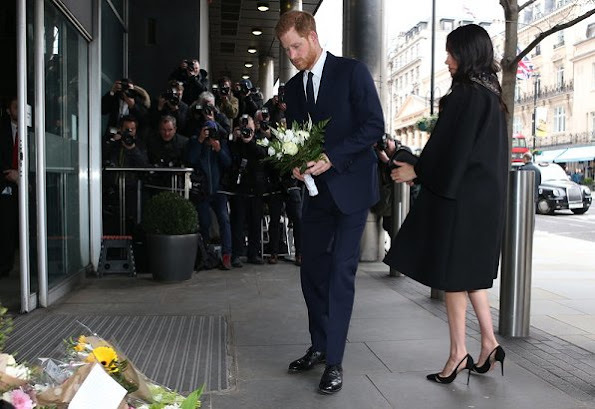 Fortunately the Queen doesn't feel as you do as she asked Harry and Meghan to represent the entire family in leading condolences to the people of New Zealand after such a tragic event. What a strange looking coat. It looks like a priest's robes. Too much volume for someone so petite, I think. The proportions don't seem to work well for her. Well the poor thing is heavily pregnant which plays havoc with every woman‘s proportions and statics but especially with those of such a petite lady. But I know what you mean. Style lessons advice you to balance the proportions of your outfit and body. Being highly pregnant your bump takes - concerning the outfit - inevitably center stage. Wearing bat sleeves additionally to the big cloth clad bump creates an abundance of material which swallows our tiny duchess. In addition we have a lot of hair and an embellished collar. In short there is a lot going on in the middle section of the Duchess of Sussex which makes her look a little bit crowded. Difficult for her because she is normally used to a svelte figure that can carry off anything. In these cases with the scrutiny of the public an experienced stylist can be a great benefit. I want those shoes in a 3 inch heel please! Are the comments here being monitored by the Palace people so as to be cautious when stating remarks deem only to be on the pleasant side of things for the royals? It seems that some opinions are being deleted when not in their favor? I just hope she will be pregnant again and being able to wear this wonderful coat (at a happier occasion) again. Very beautiful. And the signature, cute! Fashion put aside, the shootings in NZ are horrendous, as any other shootings around the world. I was very impressed by the NZ Prime Minister's reaction, she i a rock. A touching and appropriate tribute for such an appalling tragedy. As far as Meghan's clothing is concerned, Meghan worked and earned her own money, she can spend it as she wants, and who knows with such a beautiful client a lot if could be on loan. As for Meghan "bump cradling" or "bump touching" her body, her pregnancy, let her rejoice in the miracle of life as she chooses. If Meghan is enjoying and cherishing every second and every movement or flutter, good on her!